Simple changes can make a huge difference. 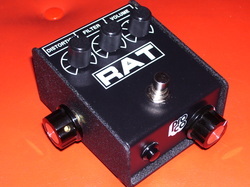 This Rat has a pot in place of the classic "Ruetz" mod, a soft touch feedback loop button and a knob to tune the feedback frequency. It's op amp has also been replaced with the LM308N chip which was used in the great Rats of old. It's a tribute to a great builder and modder named Paul Trombetta.